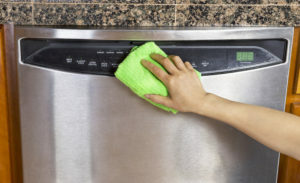 Is your dishwasher not draining completely? Although your first thought might be to repair or replace the dishwasher, the problem could actually be with the plumbing. If the water from the dishwasher encounters a blockage on its way to the drain pipe, it will have nowhere to go but back into the dishwasher. So, if your dishwasher is not draining, rule out a stoppage by following these steps. *Make sure the sink is draining. If your sink is not draining properly, the dishwasher will not drain either. In most cases the dishwasher is set up to drain through the garbage disposal. When there is food built up on the inside of the disposal there is less space for the dishwasher water to go. Run the disposal thoroughly with plenty of water to really clear out the debris inside of it. If water comes out of the air gap and all over the counter when you run the dishwasher, the blockage is between the air gap and the garbage disposal. Remove the air gap cap, locate the large tube that goes into the garbage disposal and remove it. Clear out any build up in the tube. Look at the connection between the drain tube and garbage disposal. While the air gap tube is out, check to see if the blockage is at the opening to the garbage disposal. Insert a screw driver into the small opening for the drain tube and move it around to clear it. Disconnect the drain tube from the air gap and make sure it is not plugged. If there is any debris inside the tube, clear it out before reconnecting it. If you have tried all of these fixes and the dishwasher is still not draining or need expert help, call Green’s Plumbing for assistance at (818) 880-8847 .